International Association Of Independent Journalists Inc. :: View topic - Day 2 of the UN WSIS+10 Final Review Meeting! Day 2 of the UN WSIS+10 Final Review Meeting! 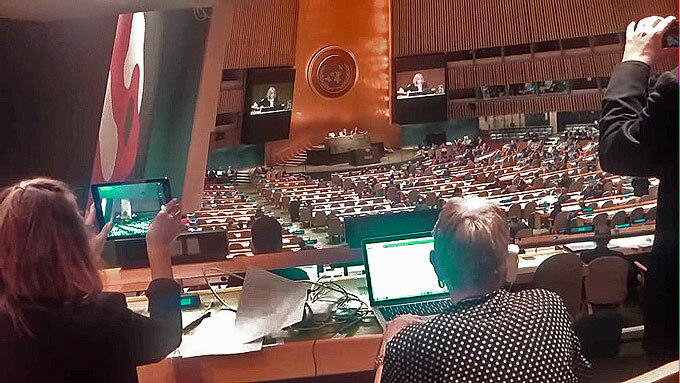 International Association Of Independent Journalists Inc. Forum Index -> All articles related to the High Level General Assembly Meeting at the United Nations on December 15-16 (2015) at UN Headquarters in New York. Posted: Sat Dec 19, 2015 3:53 pm Post subject: Day 2 of the UN WSIS+10 Final Review Meeting! By Maurice Ali - IAIJ Inc. It is over. The WSIS+10 Review process came to an end with a round of applause from almost everyone on the floor of the General Assembly. It looks like internet governance will remain the same for the next ten years when another WSIS review will take place (the IGF got another ten year mandate). NGOs and a few commercial organizations took to the famous podium at the end of the two day event and most of them I knew. They were usually one level up from us at events, most having consultative status but not all. Best speech for me was from "Access Now" simply because she polled a thousand of her members and they all wrote the speech together and most importantly is that she was in her early twenties (the youngest speaker there) and is part of the generation that will reap the benefit of what was adopted today. I know that many felt a twinge of jealousy seeing some they know take that famous lectern. But from my standpoint it was also tempered with congratulations to see some of our own NGOs get the chance to say what they wanted to say to member nations in attendance and for the record. I was surprised to see some speakers take advantage of their position on the lectern to broaden their mandate a bit and include those issues I have noticed others bring up so that most of the issues that reoccurred at the various meetings were said by one or another of the speakers. If this was deliberate than that is truly a class act by those NGO’s. Sure only so many can get up there and have that powerful audience, but getting all the issues out there in our words as civil society was good for all of us who were crammed in there at the back of the General Assembly Hall. I note that our journalist agenda was mentioned by several NGO speakers as well of the other human rights and access issues brought forth by other organizations that could not speak. I learned something that day listening to member nations of all kinds and our NGOs and hope that if the opportunity ever comes again that I can be as eloquent and classy as those that took the podium that day. Congratulations to all member nations, the co-facilitators and stakeholders in the adoption of the WSIS+10 Review agreed outcome statement and again special thanks to all those NGOs that participated, many whom I know, for a wonderful experience. The internet is still a realm of positive possibilities for mankind! A screen capture as the agreed outcome document is adopted!